Running, Chocolate, and Candy-Yes Please! Happy Monday! I hope everyone had a great weekend. I am happy to enjoy my Monday because Chicago is about to get a big burst of cold and some snow. So I am soaking up today’s balmy 50º temps. Heck, I might even throw on shorts for a run this morning. Look out! 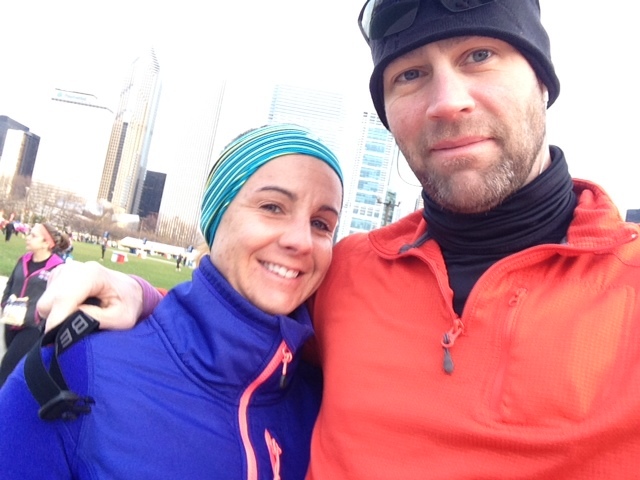 A few weeks ago right after the Chicago Marathon had ended and we were still riding the high from the race, some friends asked us to join them in running the Hot Chocolate 15K. It sounded like such a great idea. I had just finished running 34 miles on race day as a coach so I figured 9.3 would be fun and it would be nice to run a race for myself. Well after the marathon life got busy with work in NYC and I spent most of my free time just walking around the city instead of running. I did get a few six mile runs in here and there but I certainly took a nice big break. Since we arrived back home in Chicago it had been a whirlwind week of unpacking, reorganizing, and getting ready for whatever the next adventure might be. Meanwhile my husband was still dealing with his hip flexor injury that occurred during the marathon and as of this past weekend he hadn’t been able to log a single run. Friday morning we drove down to packet pickup. I don’t know what I was thinking but I thought this was a smallish race and had guessed somewhere around 5,000 participants. Imagine my shock when I found out that 40,000 people were running the 5K and 15K races combined. Despite the large numbers, packet pick up was a breeze and we received some pretty sweet sweatshirts, much nicer than your average race t-shirt or bulky sweats. We roamed the vendors and sampled hot chocolate and chocolate dipped marshmallows. Not a bad way to prep for a race. To say that we were underprepared for the race was an understatement. 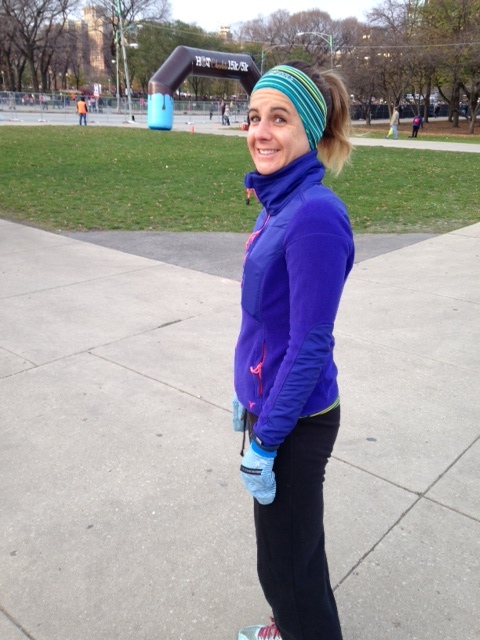 My husband hadn’t run yet, I had sort of been running but trying to keep things nice and easy. We had already planned on just running this one instead of actually “racing” but it was still an odd feeling. I’m pretty Type A and preparation and organization are pretty much my middle names. By Saturday night I was slightly dreading waking up early on Sunday morning and was kind of hoping my husband would decide it was best that he didn’t run. But when the alarm went off at 5:20am we were up and at it. However, as an excellent indicator of my excitement to run I realized in the cab ride to the race that I had forgotten to put on my Garmin. I never leave the house, even when I am not running, without my Garmin. Oops! For a race with 40,000 participants you sure couldn’t tell when we arrived. Everything was calm and organized and music was pumping. As soon as we got out of the cab we were able to walk right up to porta potties and not wait in line. Anyone who runs races knows what a luxury this is! It was super chilly and we did have to wait in our corral for over 20 minutes, but there was great music and local radio personalities keeping the crowds excited and calm. The time passed by quickly and before we knew it we were off (without a watch). My main gripe was that we ended up in corral K. Actually my husband was in C and I was in K but he hung back with me so that we didn’t have to arrive 45 minutes earlier. At the time of registration we needed to provide proof of a previous race time but we figured that since we were just doing this for fun we would forego that process. To get up into one of the first corrals you simply needed to prove that you ran a 9:00min/mile pace in a previous race. So we were in a 10:00min/mile corral that was designated as no walkers. Had I been “racing” and looking to run a faster pace or had I known that there would be 40,000 participants, I would have been really frustrated in my corral. As it was, when the horn went off and we started I was immediately met with a ton of walkers. I honestly feel like I could have added at least an extra two or three tenths of a mile to my race simply from weaving in and out of runners and walkers. But once we got to the spot where the 5K and 15K broke away from each other, the course lightened up and I was free to hit a nice and easy pace and soon felt like I was passing several fellow runners. It was at this point where the course got pretty funny. There was a strawberry marshmallow aid station, tootsie roll station, and chocolate marshmallow station. I didn’t stop for any but I can see how this would be a pretty fun incentive to opt for the longer race. The course was very pleasant and there was plenty of water and Gatorade along the way. As we ran past Soldier Field and back into Millennium Park I could see the finish and hear the music. 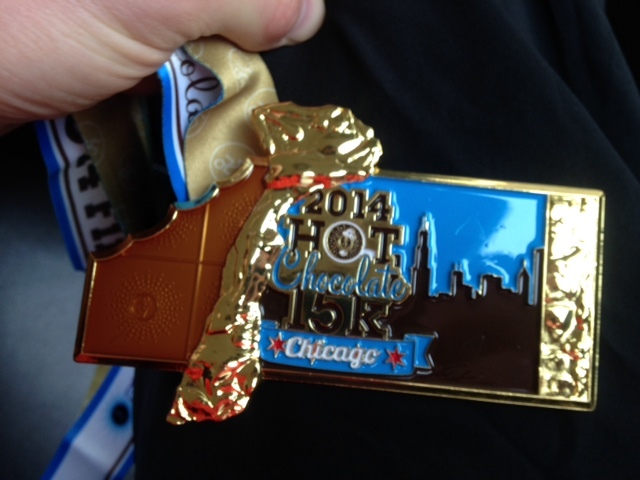 As you crossed the finish you received a pretty sweat medal that looked like a chocolate bar. Then the serious fun began. There was a great party for everyone filled with live music and of course….chocolate. Every finisher received a giant cup filled with a cup of hot chocolate, chocolate fondue and all sorts of goodies to dip in the fondue. I would totally run nine plus miles for some chocolate goodies! Let me tell you, this made the race and left a smile on everyone’s faces. It wasn’t our fastest but it was certainly a fun one. The Hot Chocolate is a series of races that occurs all over the U.S. Take a look at their website and find a race near you. Congrats to all of the Team Momentum members that ran this race: Emily, Michelle, Beccah, Leomary, Victoria, Lauren, Carrie, Cody, Ben, Nora, and Antoinette. I apologize if I missed anyone. And a Happy Birthday to a very special Team Momentum member Devin who is celebrating his golden birthday this week! Sounds like they got their act together after last year–I heard it was a cluster last year and they ran out of things! Glad that a great time! I wondered about that and had heard things. One thing that truly annoyed me was that at the candy stations the volunteers basically came into the road. They made such a tight tunnel that you were forced to walk. Again, if you were looking to “race” this would have been really annoying. I also was plowed into at mile 5 by a volunteer who ran across the road carrying a giant box and tried to beat all the runners. I may have “said” something. I ran this race 2 years ago and it was a mess. We stood outside in a LONG line for over 2 hours in the cold for packet pick up, and the race itself was so congested. So glad to hear the race has improved! What a major bummer. I have heard some horror stories and that would seriously deter me. Two hours?! That is ridiculous. Ok that is awful. Isnt that the whole point?! Mmmmm chocolate! I would totally run for chocolate. But 40000 people…………holy crap! I hope your husband feels better soon! And good luck to both of you…….it looks like it is going to get COLD! I know. And i HATE the cold!! Boo. Nice! I’ve ran the Hot Chocolate races in San Diego and in San Francisco. My biggest complain is always the post-race food. Something with nutritional value would be nice! Sarah, my blog finally released your comment from WP purgatory and I raced right over here to see your blog too. 40,000 participants? Holy cow. I had no idea. I don’t know how many runners we had here in Santa Clarita, but I am sure it wasn’t 40,000. And, you are a serious contender. This is a great blog that I am going to get my triathlon loving husband to read too. You are a champ! The hot chocolate race series is a really fun one! I did the 5k this past spring in Philly and was surprised by the number of racers too. I most certainly enjoyed the chocolate at the end too! I’ve been thinking about signing for the 15k in St. Louis and this review really makes me want to. 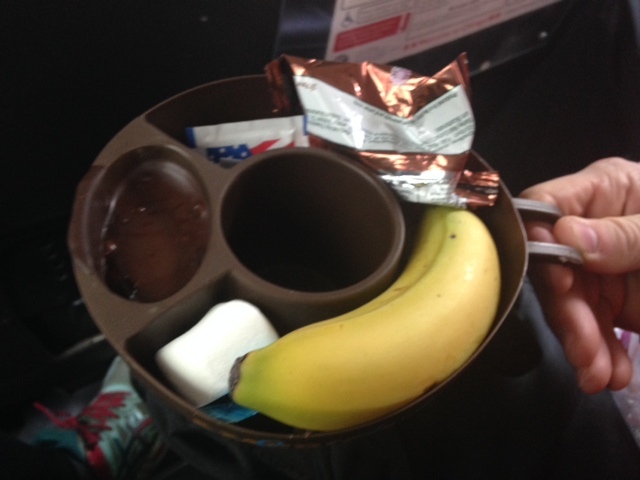 Sweet stations on the course…yum! It is definitely a fun one. Especially for a girl with a sweet tooth. That’s the best incentive I’ve ever heard to get people to run!